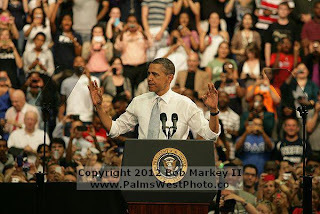 Setting aside sports for a day, the President of the United States, Barack Obama, visited FAU in the Burrow and spoke about the economy and the importance of investing in our future. While inspiring the FAU students to strive to be more educated and inspired citizens, the speech quickly turned into a campaign movement. Nonetheless, a visit by the POTUS definitely puts FAU on the map and draws national recgonition. The Owls baseball team was forced to move their originally set home game to Fort Meyers due to the visit by Obama, which led to a defeat by the FGCU Eagles (6-5). As a follow up to the previous post regarding Owl basketball players, Ray Taylor and Kore White leaving the team, recent news has leaked the transferring of freshman guard, Omari Grier. Omari was a hot topic within the FAU community early in the season, putting up a great game against cross town rival Miami Hurricanes, and draining a three pointer in the final seconds to force the game into overtime. Omari's season then took a drop once conference play began, where he spent most of his time on the bench watching his teammates play. The reason for the benching is somewhat unknown, and Omari is now looking into four schools to transfer to help him get to the next level. Will this affect the Owls next season? It's hard to answer considering the signing of three new players, who will be a huge presence for the Owls in 2013. Javier Lacunza is one of the players that will help the Owls, with his 6'8'' frame, Lacunza is a 17 year old from Spain who is seeking some fierce college play and a fan support that hopefully won't be let down. (Lacunza highlight video is shown to the right). Along with Javier, is 6'7'' Devonte Thornton, and 6'4'' Jackson Trapp. These are just three of the five players that Jarvis has got to sign for next season, Trivante Bloodman and Stephan Moody signed int the Fall. Where the Owls are headed is hard to tell before practice even begins, be we have huge anticipation for Midnight Madness in the fall (the annual event that kicks off the season for the Owls basketball team). Like The FAU Sports Informer on facebook at click here! Likes: 3 (at the moment). Comcast is striving to be more customer friendly and they are utilizing the necessary tool to do so, however it has somewhat backfired on the company. The users of Comcast have shown much dissatisfaction in their tweets about the company. When searching for post about 'comcast' and 'comcastsucks,' the post are consecutively negative and point out the bad things comcast is doing, rather than displaying any positive aspects of the company. Therefore, the use of social media and twitter is developing an outlet for the unhappy customers to show their feelings toward the company. Comcast could use these posts to understand why their customers are not happy, and potentially try to solve the problems at hand.